These are stories told by the young men who were actually at war. They are their versions of what was going on as they saw it. 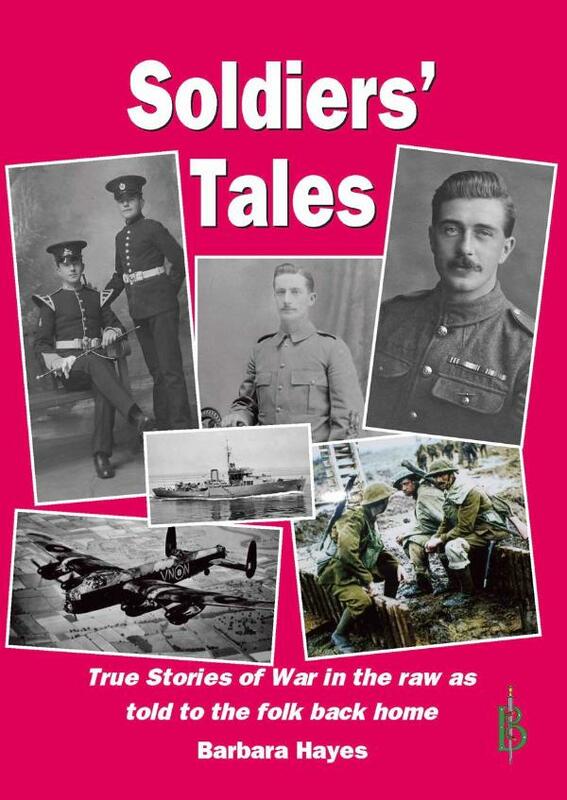 The tales come from soldiers, sailors and airmen, from the Boer War to the 21st century. This is not war as shown in the movies or war as appears in official reports. This is war as it is actually fought. In wartime there are some corners of foreign fields where things happen not quite according to the official rules and maybe unknown to the Great and the Good. Those looking at the big official picture may see something quite different from what is seen by a boy in one small part of the battlefield. But these are the stories the boys told to us girls back home. They will give you a different perspective of some famous events. All the men who told us these stories are long dead. But before I too am dead I am retelling their tales as a tribute to their memories. One of my Eggleton adoptive ‘cousins’ was a young man nine years older than I was named Stanley. Of course he had a selection of friends his own age and when they went — say playing tennis — they would call for me and my sister and take us along as ball boys, jacket guarders and wallet watchers. At the end of the afternoon we would be rewarded with an ice cream. I tell you this to explain how at the beginning of the war I came to be acquainted with Ron Ramsden, a young man of 21. He was a friend of my ‘cousin’ Stanley. No one in our circle was very well off. Everyone had jobs and lived in reasonable comfort in terraced or semi detached houses, but there was never a lot of spare money for flashy living. Then some unmarried auntie of Ron Ramsden’s left him her life savings — I have no idea how much it was — and the value of money was quite different then anyway. Everyone said how lucky Ron was to have this sum of money to give him a good start in life — perhaps he could start buying a house or just keep it in the bank for a rainy day. But then Ron spent it all on buying himself a flashy sports car. Car ownership was unknown in our circles. There was no other car in the road where Ron lived. At the weekly teatime meeting of the Eggleton family ladies (including my mother) everyone expressed disapproval at such wanton wasting of a sum of money which Ron would probably never get together again. I remember one sunny afternoon walking near the Eggleton home with Stanley and we called in to have a word with Ron. He had his new car parked at the roadside outside his house — of course where he lived had no garage. The likes of Ron were never expected to be able to afford a car. Ron was looking so happy as he polished his car. Stanley looked on with envy. Whatever the aunties said all Ron’s young men friends thought the car was marvellous. I remember looking at him and also thinking how wonderful the car looked and how happy Ron was and not at all like the foolish wastrel the aunties were talking about. I can still see his blonde hair blowing in the breeze and shining in the sunlight. Well time went by — war was declared. Stanley was called up into the army and sent first to Africa and then India and Ron Ramsden went into the Royal Air Force. Then one afternoon my mother came home from tea with the aunties. And ever since then, when there has come decision time about letting youngsters do something a bit extravagant or just for fun, I have always thought of Ron standing there in the sunshine so happy with his car. And although I am very cautious and sensible with money and always keep some saved away, I always say that — yes — some bits of money should be spent on giving people their heart’s desire — or as near as you can get just in case — like Ron — when tomorrow comes they are no longer here and are just a pile of dust in a graveyard. Another friend of Stanley’s, Walter Joseph Wesley, was a draughtsman in civilian life and when he was called up into the RAF he was trained as a navigator and flew with Bomber Command. A huge proportion of the crews in Bomber Command were killed, but Joe, as we all called him, survived. In those days before people sat glued to televisions every evening (or now I suppose glued to computers) young unmarried people — especially men home on leave — would make a circuit of their friends dropping in for an hour here or an evening there chatting and being offered a snack of whatever food the rationing would allow. Joe always used to call on us when he was on leave, probably mostly because we lived centrally in Watford and were easy to reach. People were very security conscious in those days and did not talk about anything which might help the enemy — Careless Talk Costs Lives, as all the posters said. However one time well after it had happened Joe did talk about a raid to me. He had called in to see us and my parents had gone to make tea and a snack and Joe and I were alone in the room — I suppose I would have been about fifteen or sixteen. There had recently been a huge raid by the RAF on Cologne in Germany and afterwards the newspapers had published reconnaissance photographs showing the town in ruins except for Cologne Cathedral which stood seemingly untouched amongst the surrounding devastation. The newspapers ran stories saying that the pilots and bomb aimers had been given instructions to avoid hitting this wonderful, ancient building. Now I did not know whether or not Joe had been on this particular raid and he did not say — he never said. Although long after the war another of the Eggleton family who was a computer whizz told me he had checked up and that Joe had been a navigator on one of the Dam Busting raids. He certainly went on plenty of raids. Anyway to get back to this evening in the war. I talked to Joe about these photos of Cologne Cathedral — well everyone was talking about them — and I asked him if he thought the crews had deliberately avoided hitting it. And I think Joe was probably right.